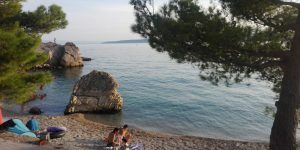 If you want a super chilled holiday – as in virtually horizontal, just lazing and swimming – then Jakuirisa, near Brela is the destination for you. Located between Omis and Makarska, Brela is the closest village to Jakuirisa. You need a car to reach both hamlets as access is via a small turning just off the main trunk road. Then a steep descent towards the clear waters and stony beaches of the Adriatic. As villages go Jakuirisa is tiny, but very well connected. A peaceful access road/walkway snakes its way right along the waters edge from Jakuirisa to Baska Voda. linking you to all the facilities you could need. Beach bars, restaurants and small supermarkets line this picturesque promenade, so you don’t need to stray far for supplies. The sunsets from this part of the coastline in late summer are spectacular and unimpeded by any land mass. Jakirusa 3 Accommodation, a basic self-catered accommodation in a stunning location right on the beach, offered us the ideal spot to indulge in a cheeky apero as the world turns pink around us. Memories that we will hold with us forever. My next visit to Croatia will hopefully carry on this easy-going holiday theme. Sailing the stunning coastline seems the ultimate way to slow down the pace of life by sliding into Croatia’s quieter laid-back ports.